Back in September I went to a workshop called Demeter & Persephone - The Mother-Daughter Story with Jane Meredith, author of Aphrodite's Magic, at Treadwell's bookshop in London. It has taken me a while to write my account of the event because it was extremely thought-provoking. In Greek mythology, Persephone - sometimes called Kore - was the daughter of Demeter, goddess of the harvest. According to the usual telling of their story, Persephone is abducted - or possibly seduced - by Hades, the king of the underworld. In grief at the loss of her daughter, Demeter turns the world to winter. Persephone, meanwhile, refuses to eat or drink anything in the realm of the dead because she knows that if she does, she will have to remain there. Eventually, Zeus declares that Persephone can return to the land of the living. 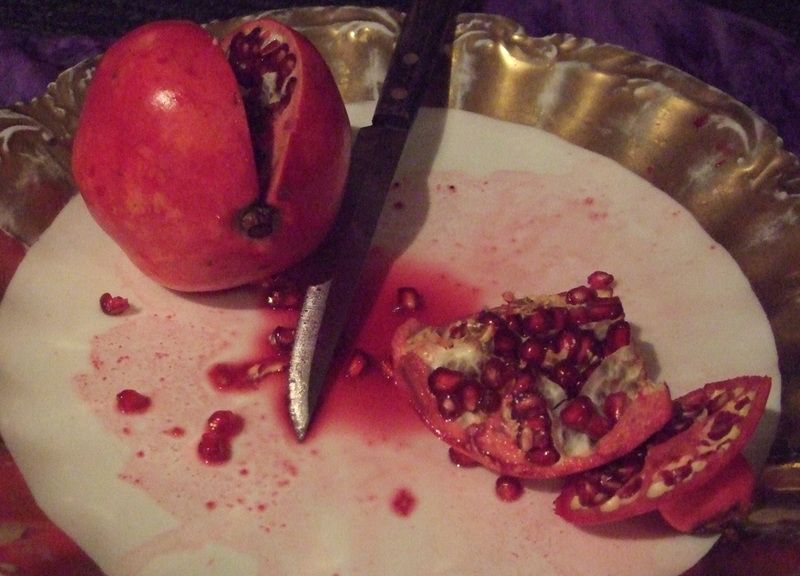 However, at the last moment, Persephone eats six pomegranate seeds. The upshot of this is that she is allowed to spend six months of each year with her mother Demeter above ground during the spring and summer, but the other six ruling the underworld alongside her husband Hades during the winter. Whether Persephone chooses to eat the pomegranate seeds deliberately, because she has fallen in love with Hades or because she likes her new role as queen of the dead, or whether she simply eats them out of hunger, is unclear. Jane Meredith's workshop was for women only and explored this myth and how it can relate to our own experiences as daughters and mothers - and as wives or partners and lovers. I must admit that before the event I was really in two minds about whether to go along or not. I have never been a mother myself, and my own mum had died quite suddenly just a few months earlier. I really wasn't sure if this workshop would be right for me at that time. To be honest, I think my concerns were justified; although the workshop was brilliant, I personally found it incredibly difficult. For the first part we had to make a collage or drawing that showed in some way our memories and feelings about our relationship with our mothers when we were children. My own memories of that time are all good ones - summer days in the garden; cooking in the kitchen; my mum reading stories to me in bed late at night. What hurts so much is that all of those things were lost long before my mother died. I cared for my mother for the last few years of her life. She was disabled, incontinent and suffered increasingly from memory loss and dementia. Towards the end, conversations with her were not easy as she was very confused and couldn't remember things she had only just said. It is difficult to look after someone who needs constant physical care, but I think it is even more difficult to look after someone who is suffering from dementia. To put it bluntly, they are not good company and I know I do not have the patience of a saint. I often felt resentful and irritable. There were frequent rows. I still loved my mother, because she was my mother, and I willingly cared for her. But the difficulties of doing that put a serious strain on those feelings of love. Before my mum died, a friend who was considering moving in with her own elderly mother to care for her asked me if my experiences of what my mum was like in old age somehow marred my memories of what she had been like before. I had to say they did - and I didn't like it. The first part of the workshop helped bring those good memories back, but with that came grief - and guilt that I had allowed those memories to be overshadowed by the difficulties of looking after my mum when she was old. It brought tears then and tears many times afterwards when I think about it. But, despite the grief, those bright and happy memories have put my memories of the difficult times into the shade - and that is very good. In the latter part of the workshop everyone taking part symbolically entered the underworld ourselves. We cut open a pomegranate fruit - which has juice the colour of blood - and each contemplated what reason we would have to eat a few pomegranate seeds to give us the power to visit the realm of the dead and stay there for at least a short time. For me, the reason became clear: it is the realm of the ancestors. I would willingly take that choice for the chance to visit the spirit of my mother and tell her how much I love her, how much I cherish my memories of her, and how much I miss. But I wouldn't eat too many of those pomegranate seeds - I know I still have many more years to enjoy in the land of the living. I have a wonderful partner and a life to lead. Yet I also know that when I reach a very old age, death will not be anything to fear. "Each part of Persephone’s story can be correlated to actions of our own, and understandings we gain, as we journey in our own dark times… and further, the myth can point out clear directions to take; such as the obvious one of if we chose NOT to eat the pomegranate, NOT to accept what we have learnt and integrate it – we would not be accepting the treasures of the Underworld, not be moving through our own story, but rather remain unchanged…"
Despite my tears, I am glad I attended Jane's workshop on Demeter and Persephone. I just wish I had done it before my mum actually died. I still have loads of stuff to deal with re my Mum's life , then her death two years ago ...no way I could do a workshop.... you were very brave to take part.